Yes, yes, it's long overdue. Been busy with work, blah blah. But I had better get this race report up before our next race starts! I was bound and determined to race on 10-10-10... but wasn't sure where. 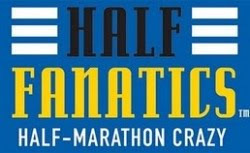 I considered Portland, which was holding its first half marathon in conjunction with the full -- but then it was MORE expensive to run the half than the full. That just seems wrong. I mean, making it the same price is fine... but it shouldn't be more. 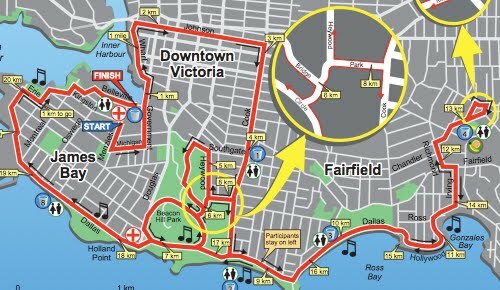 Then I saw the flyer for the Royal Victoria Marathon. Perfect! 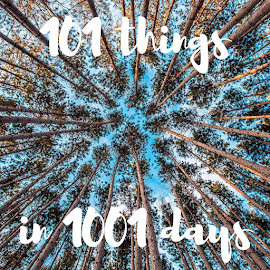 I used a coupon from the Entertainment Book to save $80 off a package on the Victoria Clipper with a night at the Chateau Victoria and two vouchers for the best museum in the world, and then sorta forgot about it. So, early Saturday morning we made our way by bus to the Clipper terminal in Seattle, checked in, and squeezed into the crowded departure "lounge". Once our bording group was called, we hurried on board and found two seats facing forward on the upper deck. Was funny to see the seats filling up with runners -- dozens of them, all chattering excitedly about the race. Had a pleasant trip -- especially when we suddenly stopped because we were surrounded by a pod of orcas who felt the need to show off a bit. Lots of babies, jumps, and glorious full-body slams. It was the first time I had ever seen orcas in the wild, so it was marvellous. Got to Victoria, cleared customs, and dropped our things off at the hotel before heading to the expo. Strange expo -- it was somehow large and small at the same time. Efficient packet pickup, nice "reusable bags" (little string backpacks), and frankly the nicest event shirt I have ever seen. First of all, the shirts were different for the half marathon and the full marathon. Second, they were different colors for men and women. Third, they were great shirts -- good quality New Balance long-sleeve tech shirts. 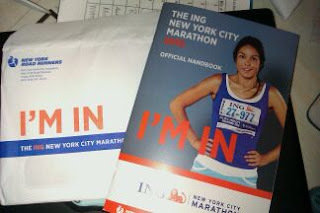 (The marathon shirts were half zips and even had an MP3-player pocket on the arm -- fantastic.) But most of all... they had a tasteful race logo on the left breast, and nothing else. No logo festival on the back. Nothing on the arm. Just the race logo. Awesome. We wandered around the expo for a little while, but there wasn't really much to look at. There was a nice New Balance store, but sadly they didn't have any souvenir materials -- no glasses, pins, etc. Got back to the city and checked in to our suite... which was glorious. Kitchenette, sitting room, dining room, balcony, and a separate bedroom with a king-size bed. Fantastic! We vowed to get take-out for dinner so we could come back and dine in splendor. We sought out an amazing vegetarian restaurant called Green Cuisine, which offered vegetarian and vegan hot buffet items... and did take-out. We managed to buy WAY TOO MUCH food... again, it's so strange to be able to eat EVERYTHING at a buffet! Back to the room where we ate too much dinner and drank our fair share of Jack and Diet Coke. Carbo-loading? Nah. The next morning we got up, dressed, and walked the couple of blocks to the start of the race. It had rained hard overnight, but the day was brightening. I wore long sleeves and was happy to have them -- even if I felt overly warm after about a mile. We started right next to the lovely capital building -- thousands of people packed into a small space, attempting to 'self-seed" into starting paces, but of course just ending up a mess. The usual nervous fidgeting, pulling at clothing and wondering if we should have worn something different. And of course a pre-race portrait. Then, suddenly, we were off. We ran around the big square and then along the waterfront, past the Empress, and into "downtown". I noticed a cool-looking comic shop and decided we should visit it later. We were still pretty tightly packed at this point -- passing some people, getting passed by others. Hey, if you need an inset map, your course is too weird. But it was a relief to leave the park and head out along Ross Bay -- gorgeous! All the way out to the turnaround we saw faster runners coming in the opposite direction -- even if they didn't seem to be going all that much faster than we were. But when we could look behind us, there were still lots of people back there. Eventually we turned away from the seafront, through a very pretty residential neighborhood, and to a little turnaround. Still felt really strong, really happy. But as soon as we hit the seafront for the return journey, the wind hit us. A strong, cold headwind. No wonder the frontrunners slowed down so much! I saw two people lose their hats. We put our heads down and ran into it, but it was amazing how slow our progress was. At the end of one stretch we hit a big hill, and basically everyone around us just stopped. One real highlight -- we got to "Mile Zero" on the Transcanada Highway and saw the Terry Fox statue in a little park. I sprinted off course to pose with him while Wil snapped a photo. I came running back onto the course as a volunteer looked at me skeptically. 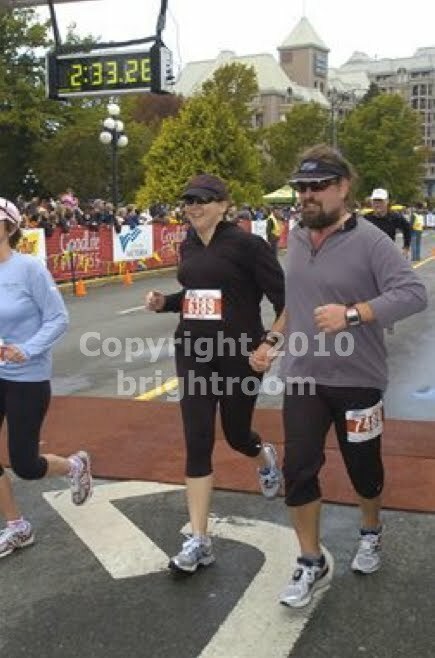 See, the full marathoners were just starting to come en masse, and I think she thought I was trying to "cut the course". I smiled and said "I had to stop and take a picture with Terry!" and she melted. "Oh, honey, that's great. Good for you!" The rest of the course was a little hazy. We ran through more neighborhoods that felt completely deserted, and mused about how the Rock 'n' Roll series has really changed the meaning of "on-course entertainment". This course supposedly had three "entertainment" stations... but all I remember is a guy blaring music from his car stereo and another person huddled in one of those pop-up tents with a couple of speakers. Oh, and the very cute family sitting in their driveway, all bundled up, playing "Chariots of Fire" over and over again. After the race we went back to our suite, had hot hot showers, a bit of lunch, and generally enjoyed the late checkout. Later in the day we would visit the Royal Victoria Museum, which I adore, and admired the woolly mammoth. Then an uneventful Clipper ride home. All in all, a fantastic little weekend. I think the course was nice enough, though I would have liked a little more support. That said, the weather wasn't great, so I probably wouldn't have spent my day shivering outside either. The medals were nice -- also nice that halfers got silver, while marathoners got gold. Fun to see plenty of people walking around rocking their medals -- more than I've seen anywhere outside of Disney races. 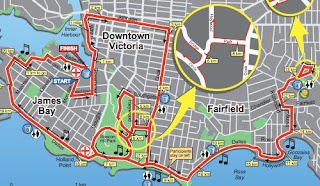 For posterity, here's the course map for the 2010 Victoria Half Marathon.